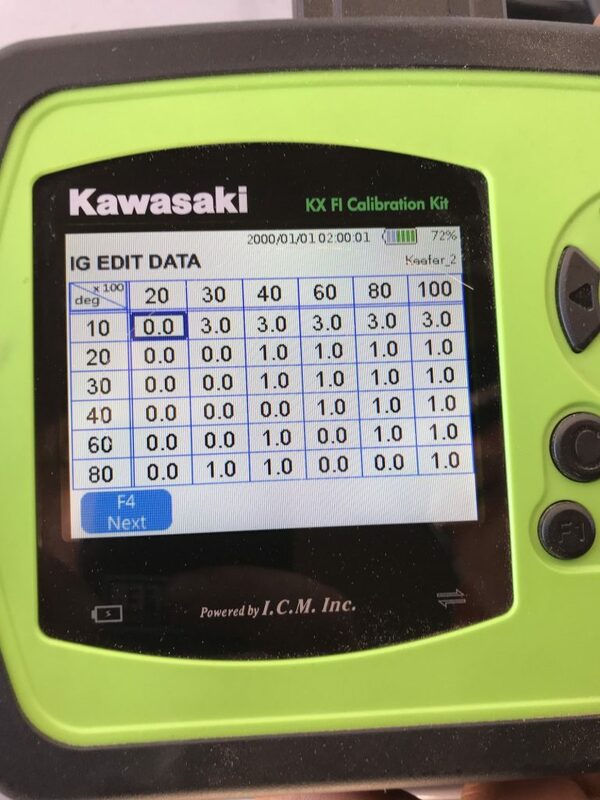 The 2019 Kawasaki KX450 is the most improved machine of the new year. Hands down! It has a very responsive engine character, comfortable suspension, a lightweight feel and a cornering character that is very neutral. I will be the first one to admit that I get nervous about sticking on any type of aftermarket muffler system when I really like the stock power curve of any machine. Sometimes aftermarket mufflers are just smoke and mirrors. They are lighter, titanium, look cool, but in the end they are no better than your heavy, ugly, big stock muffler. While I was testing the 2019 KX 450 earlier this year I could hear this little voice inside my head say “it’s going to be tough to make a muffler that is better than this stock one”. Fast forward to a couple months ago and a shiny new FMF 4.1 RCT titanium exhaust shows up at my door, to be evaluated on the green machine. 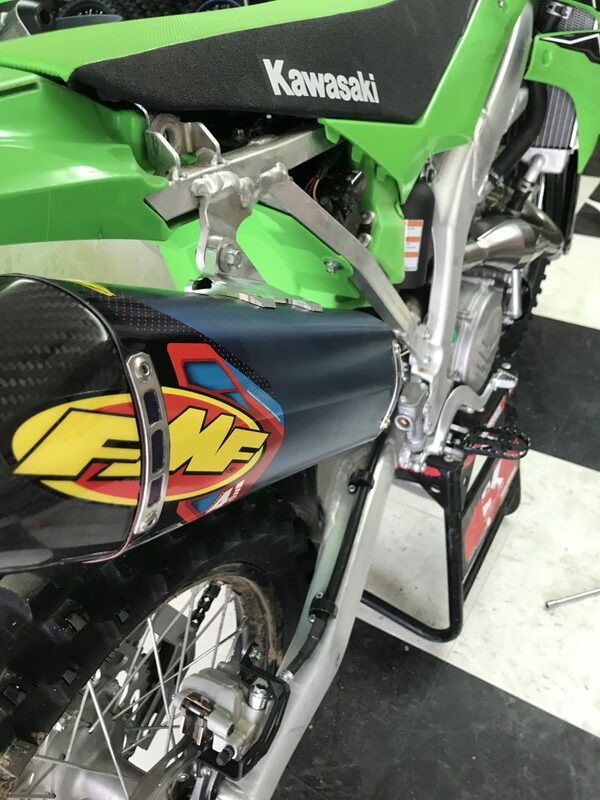 I sat on it for a week knowing that this new, shiny, lightweight piece of FMF artwork might not be better than the current monstrosity that is on the 2019 KX450. Nonetheless I installed the FMF system (which was easy I may add) and headed to the track to give it a go. 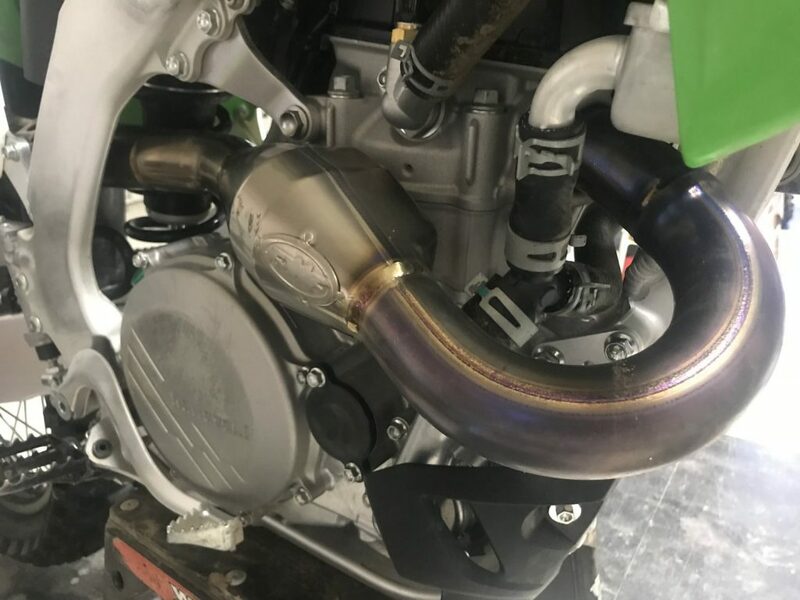 The stock power curve of the 2019 KX450 engine has a snappy throttle response (with a free feel to it) and at times can almost be too much through corners with the standard green coupler installed. Once rolling on the throttle and passed the corner, the power is not quite as strong as the Honda or Yamaha, but still creates a easy to ride power feel on the track. I didn’t necessarily need more rpm response with the 2019 KX450, but I wouldn’t mind some more meat through the mid to top end range. 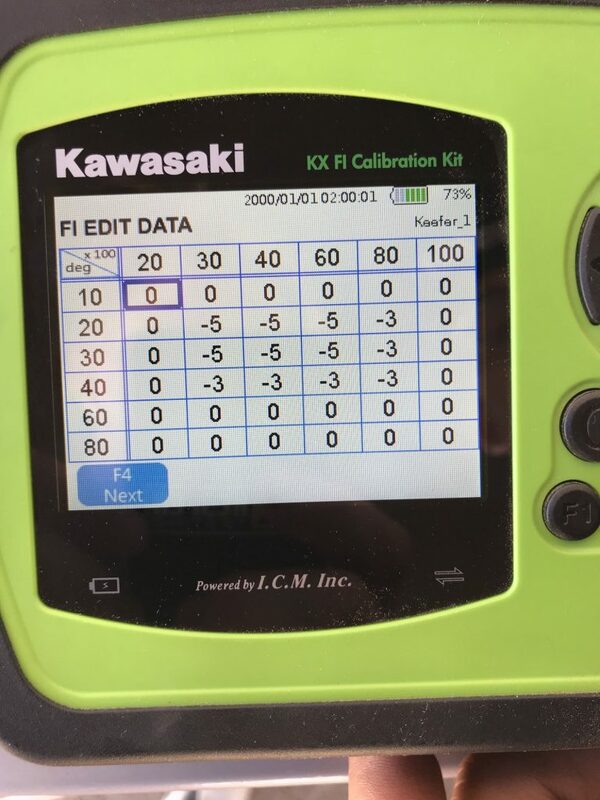 Bolting on the KX450 FMF Factory 4.1 RCT system is by far the easiest system I have installed on any 2019 machine. Installation literally took me through two and a half songs on the “Classic Rock” station on Pandora. Not bad! The 2019 Kawasaki is a light bike stock, but FMF sent me the full titanium system, which dropped the Kawasaki’s weight by 2.9 pounds from the stock system! To me the titanium FMF 4.1 system is one of the most stunning aftermarket mufflers you can put on any bike (next to an Akrapovic). I love the blue anodized finish as it looks good on almost every make and model machine there is. On the track the FMF 4.1 makes a slightly smoother bottom end power delivery, but keeps that exciting RPM response. Where most of you will feel your hard earned dollars spent is through the mid range pulling power when exiting corners. The stock system feels empty in this area, but the FMF fills in the power through the mid-range. 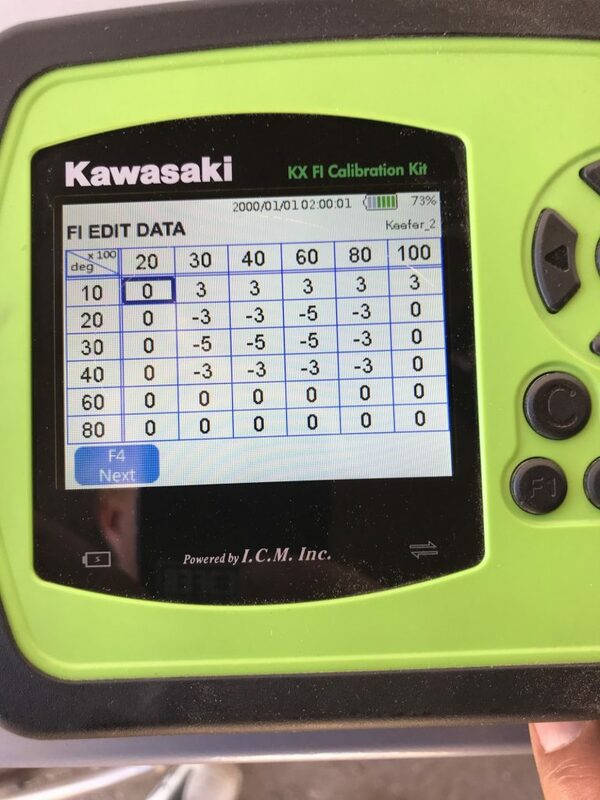 What I mean by “fill in the power” is that the FMF system actually feels like it is shooting forward, as soon as you shift into third gear, unlike the stock Kawasaki’s power where it lacks some “meat” through the mid-range. The FMF 4.1 increases that mid range area and gives the rider some more freedom to be lazier in third gear. That is great news for all you vet riders out there, trust me! Top end is also increased slightly and you get increased pulling power near the end of each straight with the FMF. Over-rev is slightly increased as well with the 4.1 (over the stock muffler) as I could leave the KX450 in second and third gear slightly longer. The one downside to me is that it is loud sounding (compared to the stock system). It has more of a deeper/throatier pitch to it, which makes it sound louder than the stocker. At the end of the day the FMF 4.1 RCT full titanium muffler system delivers a smoother roll on bottom end delivery with a mid to top end puling powerl that is better than stock (along with improved mid-top end RPM response). 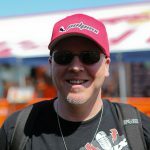 I will say this again….Being able to achieve a power delivery that is better than what an OEM muffler system can give you, is very hard to do. 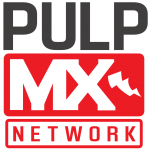 FMF has achieved this with their 4.1 system on the 2019 KX450. Not only does it make power, but it also takes off some weight and looks better than the stock bazooka. I wanted some added control down low and more mid range (on the 2019 KX450) so with this FMF system I got what I was looking for. I am not going to sit here and tell you guys that every FMF system, for every machine is better than stock, but with this one they did a pretty damn good job. 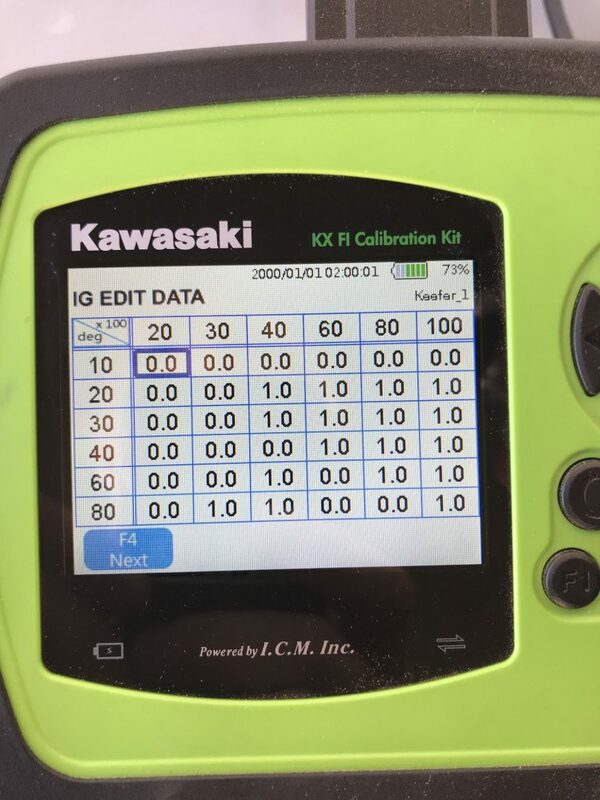 Don’t be scared to try the maps that are attached, because with today’s four-stroke technology, getting the correct mapping for a certain muffler can really make a difference. Attention mechanically inclined riders!!!!! Please note that re-packing of any muffler is important for the can’s lifespan. The muffler portion (or can) will start to leave hot spots/scarring when the packing starts to burn away from inside. Once you start seeing these “hot spot/scars/markings” on the muffler, remove and re-pack it ASAP. FMF offers re-packing kits, but taking the can apart to re-pack is not that hard to do. I get around 12-14 hard engine hours before I see these markings and have to re-pack. If you run it past the recommended time, you run the chance of hurting performance and damaging the core (or perf) inside the muffler. Don’t be a dummy and waste your money, re-pack your muff! Just an FYI the image for black coupler ignition map is actually the fuel map. Can we please get the correct ignition map? 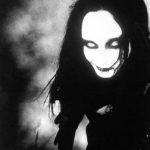 Sorry, check it out now.